The Orphanage is now run by a French charity, The Children of the Queen of Mercy Adoption Association. The children we met last year have all been adopted by French families and are now living in France. The children this year hopefully will also be adopted, although several of them are HIV and because of this will not be sent abroad. 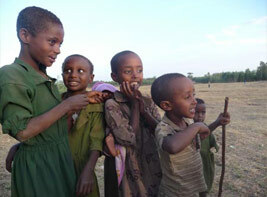 The children are still very well looked after, but the helpers have very little time to play with them. We did try hard this year to teach the children some basic numbers in both English and Amharic. Two of the older children about 12 years old were doing very well. The big hit with the others was colouring as always and a packet of balloons.